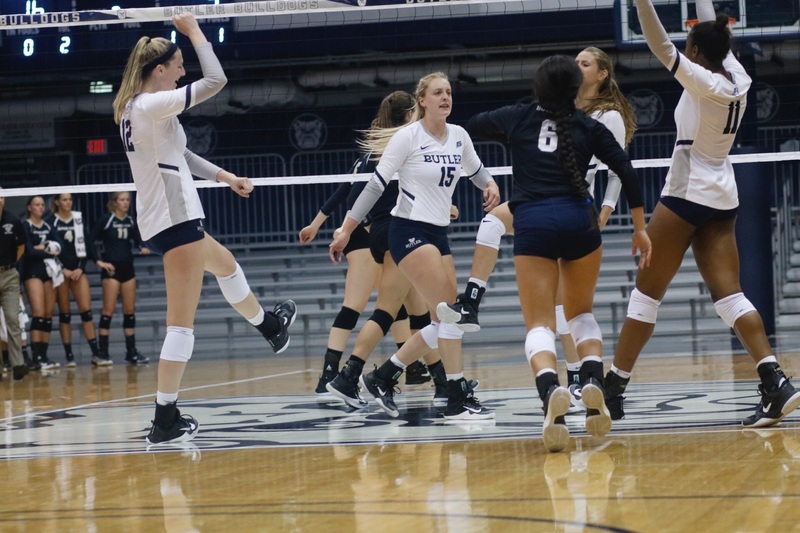 The Butler University volleyball team went 2-1 to finish second at the Michigan Invitational in Ann Arbor, Michigan over the weekend. Butler improved its record to 5-2 on the young season. The Bulldogs took a three-set loss to host No. 19 University of Michigan on Sept. 1. Redshirt junior outside hitter Whitney Beck paced the team with 12 kills and 10 digs, while junior libero Taylor Takeda posted 11 digs of her own. The pair were named to the All-Tournament team. The Bulldogs got loose before their match against University of Wisconsin-Green Bay on Sept. 2 with some dancing. The warmup worked, as Butler swept the Phoenix with scores of 25-23, 25-23, 29-27. Sophomore outside hitter Brooke Gregory led Butler with a team-high 13 kills. Butler concluded the trip with a four-set victory over the University of New Hampshire. Lilly, a junior middle blocker, led the team with five blocks and three service aces in the 13-25, 25-17, 25-17, 26-16 victory. Head coach Sharon Clark said Butler’s ability to rally back was a big positive for the weekend. Butler will travel to Kent, Ohio to participate in the Golden Flashes Classic on Sept. 8. The first match against host Kent State University is set for 6 p.m.